World War Two had an impact on everyone, not just those who were abroad in the services. In this part of the collection, we show how the war affected those on the Home Front, who were fighting the war in their own way, including experiences from day-to-day life, and those who took part in the Home Guard. A 'VJ' (Victory over Japan) party in August 1945 in Lockers Garden. It was held by the residents of Bury Hill and Cemmaes Court Road. Lionel Howard is standing on the far left. Lionel Howard grew up in Hemel Hempstead during the war. He has vivid memories of the war's impact on daily life. I think the first thing I remember about the beginning of the war was the gas masks. They were in a little cardboard box with a string that went round your neck. When we were at school they were forever having practices. You had to hook them under your chin and then stretch them over your head. A great game, being boys, was if you breathed in deeply and breathed out quickly the air used to go out of the sides and made a weird noise. When we were doing the practices all you could hear was the noises coming out of them. They made the bottom of your chin sore and they smelled of rubber. If you were getting hot and sweating all the glass used to mist up and you wasn’t supposed to take them off and wipe the inside. I was at Bury Road School or Bury Mill End as it was called then and they had the shelters in part of the playground that backed onto the houses in Ashley Hill. They were dark and cold and we used to use them for playing more than actually as shelters. It was later in the war that we seemed to spend more time in the shelters when I was at Crabtree Lane (Corner Hall School). We did some of our lessons out there. The favourite one was you would either have to recite your times tables or do a spelling bee when the master would call your name and a word and you’d have to spell it. There was virtually total darkness down there. There was some light from paraffin lamps or candles but not much. Anyway, he would call out your name and he would know who was talking so you had to behave yourself! My Dad was a bus driver during the war. I can remember that when you couldn’t get much fuel they used to have the gas making machines on the back of the buses. They had a fire inside them – think of health and safety now! But they used to have this thing burning on the back of the bus and tow it along behind them. There was a tube linked to a sort of balloon on the roof which used to run the engine of the bus. One of the main routes was from Watford to Aylesbury and every now and again there was one down at Westbrook Hay. There used to be a pile of coal there. The bus would come along and stop and the conductor would get out and stoke the fire and then they’d go on to Tring and stoke it again. It was quite amazing how they got over the fact that they didn’t have much fuel. Read more from Lionel Howard here. Nancy Newberry has written about her wartime experiences. When war broke out on 3rd September 1939 I was five years old. I was born and lived in Hemel Hempstead with my parents and three-year-old brother Michael. My father was in the Territorial Army then joined the Home Guard whose Headquarters was in a building in Heath Lane cemetery. He was issued with a rifle which was left in the house when he was at work at John Dickinson’s in Apsley. In 1942 he was conscripted into the Royal Air Force. Within a very short time our flower garden had been dug up and vegetables and small fruit bushes planted so that we always had plenty of fresh food despite the meagre allowance we had after ration books were introduced in January 1940. Rationing finally ended in 1954. As my mother had been a cook at Heath Brow School she managed what little food we did have very well. Read more from Nancy Newberry here. Geoffrey Leggett has written about his wartime experiences. [A] source of interest for Geoff during the war was the crashing of aircraft. In particular, American bombers seemed to be the most common source of such events perhaps because there were two military airfields not too far away from his home. On one occasion, he was told about an aircraft crash but it must have been some time after it actually occurred and there was not much of interest apart from some odd metal parts still lying around in the wood. There was another which also lacked interest but the third was a different matter altogether! This one was a huge bomber - an American Flying Fortress - which had crashed into a wood not far from his home near Little Gaddesden, Hertfordshire but remained largely intact apart from the wings which had been torn off by the trees, a wide strip of which had been cut short leaving a gap to the sky. There were no air force personnel on board when it crashed and, although the plane was severely damaged after crashing through a number of large trees, there was still a lot to be seen and found there. There was no guard that the lads could see when they arrived but there was a great deal of interesting debris scattered around in the wood. For example, he was astonished to see belts of half-inch machine-gun bullets mostly armour-piercing but some containing minor explosives and flashing chemical mixtures lying around the plane and ready to be picked up! There were chunky pistols used for firing flares, complete with a supply of their ammunition, one normal military pistol without any bullets and a variety of other devices, use of which was somewhat more obscure. All of this went into the bicycle bags which rapidly filled and they set off home with their treasures determined to return, better prepared, for more! They tremendously enjoyed themselves on this crash site and returned home with many items which seriously worried their parents! Read more from Geoffrey here. (Interview by Nick Tate, Freya Martin and John Ross, November 2011). In a wide-ranging conversation about Hemel Hempstead life during the war, Yvonne Butler (then Chilman) and Gwyneth Tomlin (then Daniels), who both attended Hemel Hempstead Grammar School, told us about school, sweets and air raids. Gwyneth - The junior school that I went to was Nash Mills School in Belswains Lane and the same junior school is still there and whilst we were at school there, we actually had bombs fall opposite the school. A pair of houses opposite were bombed and also the George pub, close to school. If the Germans were coming back from somewhere like Coventry and places like that, they would “ stick bomb” down the valley because at that time, this valley had the main canal, the main road – the A41 – and the railway lines all coming through and they would try to disrupt munitions and things coming from Birmingham through to the docks. And, of course, where I lived on Oliver Road, if you looked out of our front bedroom window, which was very high up, you could see the Flying Fortresses flying in and out of Bovingdon – one engine not running, bits off the tail plane and that sort of thing, so we were very conscious of it all of the time. Yvonne - Sweets were rationed and we had the equivalent of one crunchy bar a week. I used to save mine up. The local shop would save me four crunchy bars at the end of the month and that was my sweets for the month. Gwyneth - Everything had worn out and you’d grown out of things and you just couldn’t get replacements. You learned to sew because you needed to. You learned to alter things, you unpicked jumpers to knit them up into something else. That’s something else I did when I was in wartime junior school – we used to knit scarves and sea-boots and all sorts of things. The War Office used to supply the wool for that and the last lesson of the afternoon, when I was at Junior School, we used to sit and knit and the Head teacher had the most wonderful reading voice and he used to read to us. He gave me my love of literature. He used to read ‘A Christmas Carol’ to us at Christmas time and ‘Great Expectations’ and all sorts of things. He gave me a great love of books which I have never lost. Yvonne - When the air raid warning first came-at 11.00 on 3rd September 1939 – there was absolute panic of course and I lived in Heath Barn cottage at the time and I was way over on the moor - in those days no-one worried if you were out by yourself and I can see my mother now, coming to the door, in an absolute panic but it was only a practice, warning people what to do. My father, who was chauffeur to Colonel Brereton, was instructed to dig out an underground air raid shelter in the field behind the main house. This would have been somewhere above the now hard standing football area (at The Hemel Hempstead School). I wonder if it still exists today? We used it regularly. Horribly claustrophobic! Read more from Yvonne and Gwyneth here. John Stanbridge attended Hemel Hempstead Grammar School as part of its second intake. His experience at school can be read about here. Later, he farmed St Agnell’s farm in partnership with his father, as SG Stanbridge and Son, and during the war was a member of the Home Guard, as described below. They were absolutely superb. Of course, they’d all been screened so there were no Nazis amongst them and they all came from farming backgrounds. I remember one winter – I was in charge of a hedging gang. They were used to obeying orders; whatever you told them to do they did it and they didn’t try to keep the job going on to avoid new tasks. They got on with the job and finished it. There was no trouble between the girls and them. But the thing they missed was children. If anybody came into the fields with children, they played with them. The Germans were sent to different farms depending on where they were needed. They didn’t try to escape though there was no one guarding them on the farm. We used to give them all an extra ration of tea to keep them going and when I was hedging I used to put a bag of potatoes in the estate car and we cooked them in a fire. Rationing affected us. If you hadn’t got potatoes and swedes in winter you would have been in trouble. Until myxomatosis, which was after the war, we killed quite a few rabbits. Rabbit was the main meat during the war. Nearly all our hay production in the war went to London to feed rabbits. Fruit was impossible which I found particularly painful. In 1943 I suffered from yellow jaundice which means you’re not supposed to eat starch and sugar. You’re supposed to live on fruit. I lived for about six months on apples. That’s all I could get. We had our own chickens and obviously when you visited people you had some eggs with you. In nearly all the houses the back garden was dug up for potatoes and swedes and they had rows of carrots, spring onions etc. in the front. A lot of them kept rabbits. The diet was monotonous and dull but offal was not rationed so you could get that. The village shop - and you had to keep your mouth shut about this - when they issued him with his cheese or his bacon ration they didn’t give him 50 times X they gave him 55 times X to cover for mistakes in cutting up. Well, if he had a little joint left over, the locals got treated. This was in Cupids Green where the Grove Hill estate is now. Read more about John's farm life here. It was dark down there, but we were not really scared because we were all in it together. I seem to recall that there was some form of artificial lighting, probably paraffin lamps. We sat on benches facing each other. There was no heating. We spent many hours in the shelters, particularly when the V1 (Doodlebug) attacks started followed by the V2 rockets. I believe I am right in saying that we did some of our end of year exams in 1944 sitting in the shelters. Air raid precautions included blackout blinds and putting gummed tape over window panes to avoid flying glass in the event of a bomb falling nearby. The few vehicles that were around had masks over their headlights. If we wanted to go out after dark, to visit the outside toilet, for instance, we had to use a shaded torch, such as one with a cloth covering it. Those toilets were unlit and could be scary in themselves with spiders and other creepy crawlies lurking in the corners! My wife’s family had an outside toilet at their cottage. Fortunately ours was indoors. ARP wardens patrolled the streets to ensure nobody violated the blackout regulations. Cars had masks over their headlights and bumpers painted white. They were stationed at Bovingdon where they took over the airfield from the RAF. I vividly recall the arrival of these men in strange uniforms and of Afro-American origin. It was the first time for many of us local people to see men who were not white. That contingent soon disappeared but the Americans remained at the airfield until well after the war ended. 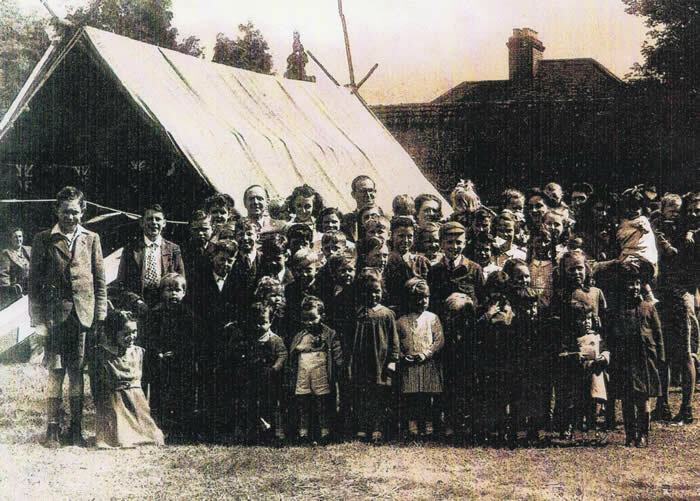 They were generally very friendly to us children and we would sometimes meet them coming out of pubs and ask for chewing gum, “Have you any gum, chum?” One year we were invited by the Americans to a Christmas party at Bovingdon. They picked us up in town and transported us to the airfield and did us proud. We got lots of goodies, such as chocolate which was a real luxury as sweets were not available at all during the war years as I recall. Read more about Peter Mullard's experiences, including his descriptions of Hemel in 1939-45 here. When the air raid sirens went at school, we had to move into the corridors and sit on mattresses. Of course the frightening times were when we heard the drone of the doodlebugs stop. That was when we were told that the explosion would be ten seconds after the sound stopped. We all cheered up when the all-clear continuous siren sounded, as thankfully no bombs or doodlebugs landed near us. At home we had a couple of soldiers billetted with us for a while, but not at the same time. We also had two young boys of my age, also at different times. They were evacuated out of London's Cricklewood area to be safer in Hemel. I remember that one of the boys ran away the day after he arrived - he wanted to be back with his mum! Coxpond, which was later filled in, was an attraction for us kids, but during the war it was used by the army, including the US army, for submersion trials. The army vehicles, tanks as well, ran in one side of the pond and out the other, probably getting half-submerged. The water sensitive parts of the engines had been covered with a heavy, smelly wax for the trials. We kids loved to be around because we got rides and sweets/chewing gum from the soldiers. Read more from Barrie here. I always remember September 3rd, 1939, when war was declared. I’d gone along to the little general shop at the bottom of Astley Road to get something and the siren went. I was absolutely petrified. I ran back along the road, it was only a matter of 500 yards, I suppose, and promptly dived under the kitchen table thinking we were going to be bombed. I can still remember it quite clearly now. I think they were probably practising, or to let people know what the air raid siren sounded like. There was one nasty incident down in Belswains Lane when nine people were killed and two houses demolished. On another occasion there was one dropped in Astley Road where three houses were demolished and one person killed. The German bombers just used to sort of - if they’d got any bombs left and were trying to get home - they just used to jettison the bombs anywhere to get rid of them. I know on quite a lot of occasions when my sister and I were in bed together (there were no single beds in those days) we used to hear the German aircraft coming over and it was a terrible, awful drone of the engines. We used to lie there frightened to death and then once the noise had stopped you could start breathing again until the next wave came over. Not very nice but something you had to put up with. It was awful. In fact, when I think back now, I don’t know how my Mum fed us - there were four of us in the family. I remember coming out of the factory where I worked one Saturday morning, and just along the Broadway there was a greengrocers called Leago's and I used to go in there and get vegetables and things like that. I was one of their customers. One day I realised there was a queue. ‘Oh great, I’m going to get on the end of this queue.’ Mrs Leago came out and she looked along the queue and she said, ‘Vera, come along, you’re one of my customers. You don’t need to queue.’ I came out of the queue - I thought ‘Oh dear, Oh dear’ and went straight in the shop and I suppose got about four bananas. But that walk of shame! It was dreadful! You could imagine all the other people standing there. What were their thoughts, I wonder? Read more from Vera here. July 1940 saw me leave the world of the classroom and enter the workplace. We had seen the evacuation from Dunkirk; the German advance through Europe and the Battle of Britain. The world was in turmoil. Not the sort of time to be looking for a job especially with the prospect of being called up into the army in two years time. Besides who would want to employ a young boy just out of school with no experience and no long-term prospects. So for the August and September of that year, despite the threat of invasion and the general uncertainty, I spent the time with my friends playing tennis most days and with glorious weather for the majority of the time, out in the local countryside enjoying ourselves oblivious to the perilous situation which hung over the country. I cannot remember being the least bit worried about the uncertain future. During those months, together with my friend from school Bill Thomas, I did reluctantly go for an interview in London about employment with London Transport. Needless to say they had nothing to offer us. Read more from Pat here. 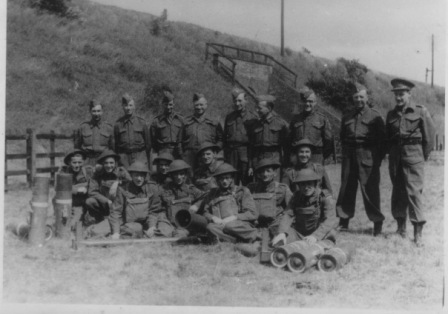 The Home Guard was set up in May 1940, first known as the 'Local Defence Volunteers' and often nicknamed 'Dad's Army'. Its aim was to provide useful war work for men who were too old or unfit to be in the regular forces. That meant getting them to carry out, for example, sentry duties. This released younger and/or fitter men for fighting. The Home Guard was also expected to form part of the defence of Britain should there be an invasion. Later in the war it was used as way of training boys of age seventeen before they could enlist in the forces at eighteen. We were well very equipped towards the end. We had Canadian Brownings which had a .300 inches diameter. This sometimes caused problems as the standard Lee Enfield rifle, used by the regular army, was .303 calibres. If a member of the Home Guard got some ‘surplus’ ammunition from a friend in the Army, it could cause problems. 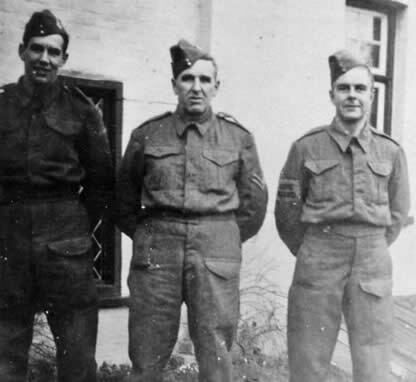 We were called the Local Defence Force and Churchill re-named it the Home Guard. A very clever move that was and not only that, they took it further. They made us a section of the British Army and our officers were given full commissions. We were allowed to wear the Herts badge on our caps and that’s when morale went up tremendously. [A] ... thing we did without knowing what we were doing at the time and it was really too much for us. Just before D-Day we had to patrol the railway lines because they were bringing all the material from the north down to the south coast. We had to pay particular attention to the bridges. We did it for about 3 weeks and then they decided they’d got all the materials down here and we couldn’t stand the pace. Not only were we doing all these hours, we were working 60 hours a week. Read more about John's experiences here.